Dermal Therapy Soap Free Wash is a mild and effective soap-free formula that thoroughly cleanses, without stripping the skin of its essential oils. Dermal Therapy Soap Free Wash is made from naturally-derived ingredients known for their immediate hydrating ability. Formulated and designed for dry and sensitive skin and itchy or flaking skin. Suitable for all skin types and for use on children from two years of age. Ideal for use in the shower, bath or basin and mild enough for daily use on the entire family. Apply to wet skin. Massage in gentle circular motions, rinse thoroughly and gently pat dry. For best results, use in conjunction with Dermal Therapy Dry Skin Lotion. Aqua (Water), Glycerine (Vegetable), Cocamidopropyl Betaine (Palm Oil), Hydroxypropyl Starch Phosphate (Corn), Decyl Glucoside (Vegetable), Benzyl Alcohol, Sodium Chloride, Potassium Sorbate, Sodium Benzoate, Dehydroxanthan Gum (Corn or Soy), Lauryl Glucoside (Vegetable based), Stearyl Citrate (Vegetable based), Sodium Hydroxymethylglycinate (Amino Acid Derivative), Citric Acid (Corn), Propanediol, Benzoic Acid, Salvia Sclarea (Clary Sage) Extract. In a controlled eight day trial, subjects were tested on using water, Dermal Therapy Soap Free Wash and a wash that contained 0.2% of SDS. The trial was conducted using The Tewameter TM 210 to measure the water loss on the skin surface. 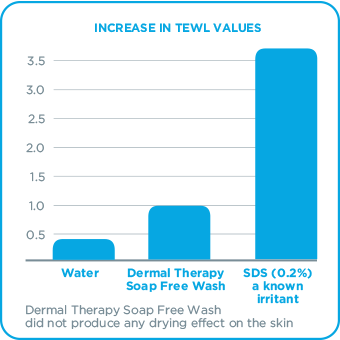 The results found were that the TEWL value of water was 0.3, whereas in comparison to Dermal Therapy Soap Free Wash it was 0.7. Therefore the conclusion was that the product is almost as least drying as water. In a controlled trial the Duhring Chamber Test was conducted on subjects with healthy skin over a period of eight days. The trial was determined using Water, Dermal Therapy Soap Free Wash and a wash that contained 0.2% of SDS to measure irritation of the skins surface. 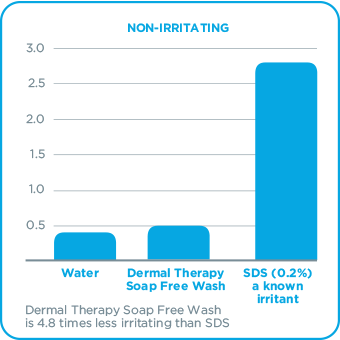 The results found that Dermal Therapy Soap Free Wash did not produce any signs of irritation, and is therefore as low irritating as water and 4.8 times less irritating than the wash that contained 0.2% of SDS. NSW, Australia - Bryson S.